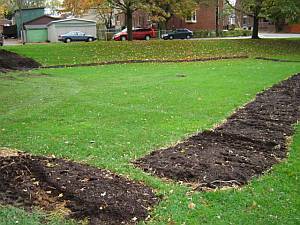 Thanksgiving weekend this year saw FoodShare staff and volunteers start the proposed youth garden, at the southwest corner of Dufferin Grove Park. FoodShare has moved just up the street, into the former Brockton High School as of this week. They are collaborating with Parks, Forestry and Recreation, with the assisstance of the community, to put a teaching garden into the park. Foodshare leaders will help local youth maintain the garden and at the same time teach them how non-traditional vegetables can be grown. Since then, work has been stopped on the garden, until the spring when a community meeting can be held, in response to neighbours opposed to the project. To follow the email thread, please refer to the FoodShare Youth Teaching Garden link. Over the last three weeks, the garden has been repeatedly vandalised. 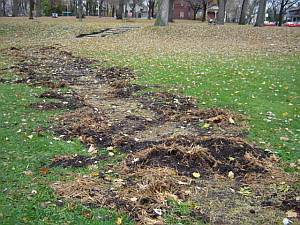 As of today, Saturday, November 11th, 2006, the outline of the garden (the only thing that was laid down) has been completely overturned. In certain sections, parts of the garden are missing. In others, straw and cardboard and compost are mixed up all together. 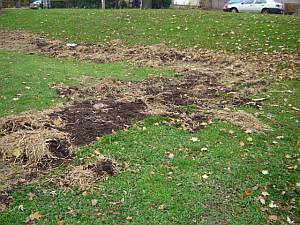 It also appears that someone has raked the ground under the garden so that no grass will be able to grow there. This destruction in the park has been reported to the Police. 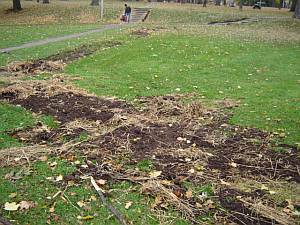 We ask that anyone seeing the vandals to call On-Site Park Staff Emergency number at 416-896-8942 or the Police. If you have any information you can send us an email at vandalism@dufferinpark.ca, leave a message at the rink house at 416 392-0913, or call the Non-Emergency Police Phone number at 416-808-2222. Below are pictures from before and after the vandalism. For years and years, park friends have been trying to invite the head of Fourteen Division to visit the park and find out a bit more about it. Three superintendents in a row couldn’t make it, but on September 13, the most recent superintendent – in this position since last May – not only visited the park, but stayed for lunch. Superintendent Ruth White brought an inspector with her and they walked all around the park, talked to the staff, ate soup, park bread, and cookies, and watched the farmers setting up for market (she came on a Thursday). When she arrived at the park, Supt. White pointed out that the bake-oven and the gardens nearby obstruct sight lines for police, and might not be a good idea. However, when she heard about the way the oven attracts people to the park, and thereby helps to mingle the various park users, making them more familiar with each other (including some of the “jailbirds” who come to the park from time to time), Supt. White said she could see how that would actually promote safety. Later on, Supt. White spoke to the park staff about their concerns regarding the frequent police practice of asking park youth for i.d., simply because they are in the park, not because of any specific search. The staff said they are concerned about civil liberties. But the superintendent was very firm in her position – she tells her officers to collect as many youth names and addresses as they can, so that they can map who uses the park, in case of crimes later. This is part of a new program that has police checking for truancy and internet blogs as well. Requesting identification and information in this way is not everyone’s idea of civil liberties. Canadian law specifically says that police can only require identification if they have reason to believe a crime has been committed. In this case police say they are only asking, not requiring. However, the distinction may be lost on the youth. Supt.White seems to be a straight-shooter who speaks her mind. She already changed her mind once, about the ovens and gardens being dangerous blocks of police sight lines. Maybe – if she’s invited to have a conversation with park users – she might alter her position on random i.d.’s of youth in the park as well. If you want to take part in such a conversation, e-mail police@dufferinpark.ca, or leave your name and phone number with the park staff at 416 392-0913, and you’ll get on the list to be notified when a time is set. Last week, as I was knee-deep in preparations for the Night of Dread, I began the afternoon with an interesting encounter with three of the young guys who hang out under the veranda of the field house where Clay and Paper Theatre is centred. When I rode up on my bike found myself in the middle of a discussion. A young man who identified himself as “Persian” was enthusiastically praising the wonder and joy of the celebration of the end of Ramadan. He was especially proud of the fact that he had invited some of his “white” friends to the celebrations and that they and he had had such a good time. He included me in the conversation as he went on and on about the goodness of multi-culturalism! He was boasting to us about how much his Irish friend had enjoyed the celebration. I left them there still talking about Ramadan and went to the rink house to continue preparations for Night of Dread. Around five o’clock I rode my bike and trailer back to the field house with some materials I needed to drop off. The guys were still there (as they often are) but there were now six or seven more, and there were two police cars which soon became four, with eight police officers surrounding the young men. What I witnessed next seemed to me something one should not expect in Canada. Also witnessing their behaviour with me were two Dufferin Grove employees, one of whom eventually got a clip board and took down as many of the officer’s numbers as time would allow. All of the young men were men of colour. The police were aggressive, demanding I.D from each of the young men. Many, perhaps all, of the young men were searched. Only one of them was eventually charged with something and he was taken into custody and put in a car. There was much arguing. In one particularly hair-raising moment, one of the young men (who I see often at the field house and who was one of the original three), a handsome, slouchy, swaggering guy, was arguing with an officer and stepped slightly towards that officer. The officer shouted: “Stand back! Back up!” again and again. The young man stood his ground, then, shrugging, took a couple of small shuffling steps backwards. Good move, I thought. But the policeman kept shouting, put his right hand on the gun on his right rear/rump, stepped into the space that the young man had just yielded, and shouted, “Do you see my hand is on my gun? Back up! Back up! I told you to back up!”. Though the young man’s pride was clearly keeping him at the edge, his friends successfully got him to back away sufficiently to satisfy the mad policeman. Eventually the police’s fishing expedition was finished and they drove off. So what did the police teach those young men ( and me)? I have always believed that a citizen is not required to give the police I.D. unless charged with a crime. (And that I have a right not to be searched unless charged!) Wrong! Did we learn that the police are above the law, and that, although I am not (technically) required to give the police my ID unless I’m charged with a crime, if I am a person of colour or young or I’ve got a little attitude, the police are not constrained to abide by the charter of rights and freedoms. Yes, that seems to be the lesson. Park staff Mayssan Shuja, Amy Withers, Corey Chivers, Anna Galati, ex-staff Daniel Cayley and park friend Jutta Mason went to court in the middle of October to follow up on a big problem at the rink. Last rink season, several “rink rat” youth caused so much trouble and grief in and around the rink house, damaging property and intimidating other rink users, that after weeks of second and third chances and negotiation, the police were called. They searched these youth and one of them was arrested and charged with possession of a concealed weapon (a large knife). One of the rink staff had been subpoenaed as a witness for this trial. The other staff who came along had all dealt with the youth a lot, and all were very concerned about him, feeling he needs attention and help to change from a very bad direction. But none of the rink staff got to say anything in court. In fact, the whole business was carried out between the Crown – who did not ever ask to speak to any park staff – and the youth’s lawyer, in a side room away from the courtroom. The lawyer said that the case was weak, since the youth had admitted to police that he carried the knife “for self-defence.” That’s illegal, but the lawyer said the youth should have been offered a lawyer before he said anything: “maybe he was carrying the knife to peel apples.” The Crown lawyer agreed that the case was weak. So it was settled between them that the youth would have to work twenty hours doing community service (supervised by the lawyer), and everyone was told to go home. Case closed. Two months of destructive behaviour by a youth at Dufferin Rink, vandalism of park property and rink staff property, intimidating other rink users, non-compliance with a ban from being in the park, carrying a concealed knife, leading to arrest: the court-ordered penalty is 20 hours of community service at a location of the youth’s own choosing. Dufferin Rink staff are puzzled that there’s so much talk about the need to connect the justice system with the community. The staff had heard that Youth Court is supposed to be a bit less formal than the more rigid adult courts, a bit more open to talk and real negotiation including all the parties, but the evidence was not there. The reality in this case was that the community affected by this young guy’s behaviour seemed to have no standing at all. Now the rink staff know that this winter, if they are worried about another kid like this one, they’d better find a different way to deal with the problem. The courts downtown won’t help. Perhaps rink staff and park friends together will be able to work out a more local forum, if there’s a youth in trouble. There is a little-used provision in the new Youth Justice Act that could allow local police to help with this directly, but police are disinclined to use it because they feel they might be sued. Do any park friends know more about this? If so, please talk to the rink staff: all good ideas appreciated! One morning in summer, park staff person Amy Withers came across a police car parked by the basketball court. The officer said he was watching for drug deals, but since there seemed to be nobody around, Amy brought him a copy of the park newsletter, so that he could become a little more acquainted with what goes on in this park. The officer refused it, and drove away. In case Amy’s offer alarmed the officer, Jutta wrote to the superintendent, asking if she might visit the park, meet the staff and whatever park users are around, and talk about what goes on here. Time for a fresh start! At about two a.m. last Hallowe’en, park neighbour and friend Bruce Whitaker was awakened by the sound of cracking and smashing in the park. He got up and looked, and called the police. Two cruisers happened to be in the neighborhood already and came within minutes. They arrested a young person under 18 for vandalizing the cob courtyard that was built by many neighborhood people under Georgie Donais’ direction all last summer. With some large stones, the young man had destroyed half of artist Susan Szenes intricate mosaic counter, all the plumbing fixtures on the public health sinks, and three-quarters of the tiles painted for the cob courtyard by park children. He had also made many holes in the walls. The cob walls are much too strong to break down, but the many holes in the plaster would give access to winter snow and rain (and so there is some interior water penetration now). But no matter where we asked, we couldn’t find out anything about the court case. In frustration, we turned to the City’s legal department, to see if they could gain standing at the trial. That’s when we found out that the city does not use their lawyers to follow up on vandalism even when an arrest is made. Their reason: it would not be cost-effective. Many park friends disagree. If the police know that the City will not go to court for vandalism, why would the police take the trouble to investigate such acts? They would see it as a waste of their time. Beyond that, news gets around. Many youth know that the City doesn’t follow up in vandalism arrests. So why should they worry about doing antisocial acts in public space? Since concern about antisocial acts by youth is currently running high in Toronto, we contacted City Councillor Adam Giambrone and the mayor’s office. The councillor said he is looking into changing policy but we are asking for a meeting with city lawyers, so that park staff and cob builders can explain our thinking to them. Watch the newsletter for follow-up. Since the City (owner of the park and everything in it) took no role in contacting the courts about the youth who vandalized the cob courtyard, other ways had to be found. After much searching and phone tag by park staff, Jutta Mason went to the youth court at 311 Jarvis Street. She walked up and down the office corridors and looked at door signs until she found the youth’s probation worker. Then they had a long talk. It turned out that the probation worker lives in this area. She had watched the cob courtyard being built and had brought her whole family over to see it at Thanksgiving. (Toronto is a small town!) Not only that – the probation worker had read in the December Park Newsletter, posted on the rink shed, that we were frustrated because we couldn’t contact the court about the cob vandalism. The probation worker knew how much community effort had gone into the cob courtyard. So she had told the young man, after he formally accepted responsibility for the damage in the park last November, that he would not be charged if he went and talked to the cob builders, and also helped to repair the damage. But there was a snag – before the young man could do any repair work, young offender diversion procedure says there first has to be a “talking circle” on the model of what native people do (they call it a “healing circle”). Everyone with a specific concern about the incident, including the young man’s friends and the cob courtyard builders, could be involved. The agency employed to set up and lead this circle is called Peacebuilders International. They are based in St. James Town and Regent Park, and they hadn’t contacted us because they had never heard of Dufferin Grove Park and didn’t know how to find us. So we invited their worker to the park and had a good talk with him. Now we hope the preparations for direct contact are going ahead. More news next month. I had a frustrating experience yesterday that I'd like to share with you. Feel free to post this on your website or email it out. I am trying to find a tenant to share my house with and thought I found the perfect one. A friend of mine was all prepared to move in and came by yesterday to check out the place. But she was basically scared off by police and crime. Here's what's happened. She took the subway over with another friend and they were getting out at the Lansdowne subway -- the Emerson Street exit --when they saw three police officers on bikes. My friend explained that she was thinking of moving to the area and asked the officers what it was like. They told her it's a crime-ridden area and advised her against t it. The police said they certainly wouldn't want any of their family members living here. Said it's especially unsafe for young women. The police said the Coffee Time at the corner of Lansdowne and Bloor was a notorious crack-dealing hangout. They said the dealers/users aren't from the area but this is where they came to do business. The police said they would never walk around here at night. While crime happens throughout the city, this is the "hub," they said. There is a lot of prostitution in the area, too, the police told my friends. While the prostitution slows down in the winter, it is very bad in the summer. The police also told them that there are shelters in the area that attract some unsavoury characters. They said Bloor Street -- specifically at Lansdowne, Marguerita and Brock -- was particularly bad. East of Dufferin is nice, but west of Dufferin is bad. Needless to say, I'm now without a tenant. This has also got me worried about the safety of my 19-year-old niece who's going to come and live with me after she moves out of her U-of-T residence at the end of the school year. I was honestly looking at the MLS listings before writing this, wondering if I would be better off moving. Here's what I don't understand. If the police are so very aware of the problems here, why don't they do more to crack down on them? If they know that the Coffee Time is a big crack hangout, why not clean it up? My friend actually asked the police if all the new police hiring will help the situation, but the officers responded that any new hirees would essentially just replace some 300 officers planning to retire. The really weird/pathetic thing about all of this is that this is the second time police have scared off a potential tenant for me. A couple of years ago, a young woman, accompanied by her friend, came to look at my place. They were meeting at the Lansdowne subway and one arrived a little before the other. She waited for her friend outside the station where a police officer approached her and asked her what she was doing there. The woman explained that she was waiting for a friend. The officer told her she better be careful because this was a very dangerous area. Again, needless to say, they didn't want to live on St. Clarens. How do we deal with this? Is it an issue of more policing? Are police afraid that if they did crack down, it would just send troublemakers to other parts of the city? Do we we just resign ourselves to living in a bad neighbourhood? What do the police think is needed to get to the bottom of this?